Twitter is truly a global phenomenon. From its humble beginnings in the heart of San Francisco, Twitter is now being used in nearly every country around the world. 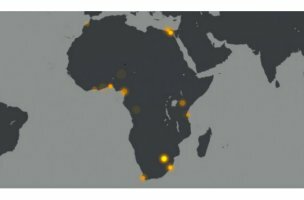 African Twitter users are just as Twitter-obsessed as their global counterparts, and a new study shows where the most eager tweeters live across the continent. Communication company Portland conducted an in-depth study of African Twitter use in their second How Africa Tweets report. The first report from 2012 analyzed over 11.5 million tweets and found that 44 percent came from South Africa, with 57 percent being sent via mobile. This report digs deeper into Twitter usage across the continent, uncovering which cities are the most active, what languages are used most frequently, and what issues drive the majority of the Twitter-based conversations.